The Ottawa International Buskerfest (July 28 to Aug. 1) is celebrating its 25th anniversary with 25 acts. A: Buskerfest is Ottawa’s most accessible festival. 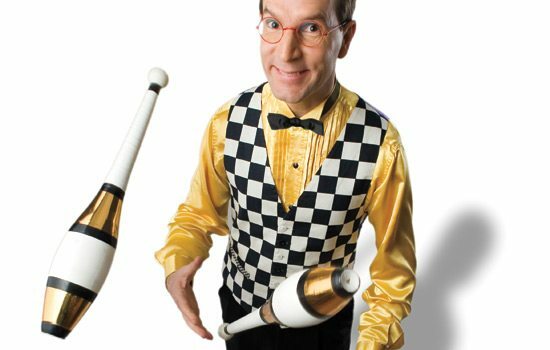 Crowds of every demographic can come down to Sparks Street and watch world class, family-friendly Busker shows that are full of circus, comedy, magic, music, juggling, contortion — right at street level. There is no ticket price for the festival; patrons are encouraged to “pay what you can” into the buskers’ hats at the end of the show. A: The Buskers and Burlesque show is ALWAYS full of surprises… as are all of the group shows where performers collaborate with other performers, and showcase their best routines. Pyromancer, aka “the flaming fart guy,” from the Netherlands is one of the shows Wilson is looking forward to this year. A: We have booked festival favourites from the past 25 years, and even the festival producer (myself) and technical director will be getting out to do a few shows. In the 25 acts for 25 years theme, we’re celebrating collaboration. Performers will be getting together and putting on once in a lifetime shows that are not to be missed! A couple of acts not to miss are last year’s People’s Choice Award Winners Throw to Catch. They’re wacky characters with some of the biggest circus stunts ever performed outdoors! 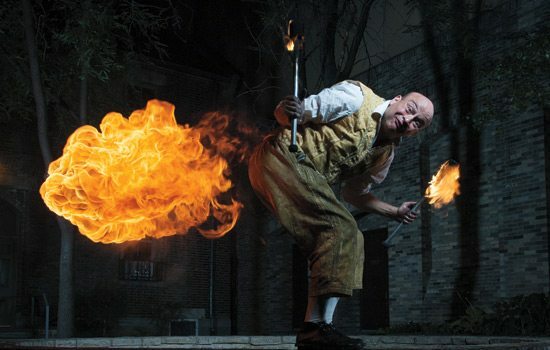 Pyromancer, aka “the flaming fart guy,” will be back from the Netherlands with his family-friendly fire spectacle. Don’t miss the physical comedy and shenanigans of Glenn Singer “Horseguy.” His career has spanned over four decades with shows all over the world. Q: What is the most surprising thing about your performances? A: When something I never planned happens in the middle of a show. 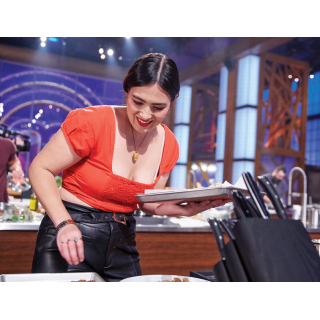 I had a guy ride his Harley into the middle of my show once; I’ve had a child volunteer more or less stop the show to discuss the meaning of life and, without question, some of the best jokes in my show have been reverse engineered to feel spontaneous based on smart remarks that have been yelled out by hecklers. I welcome the opportunity to play and wallow in the unexpected surprises that my audience throws at me. These surprises keep me on my toes whether I’m juggling seven balls, climbing up a free-standing ladder, or juggling dangerous objects on top of a seven-foot unicycle of death. All of the props, and all of the routines, are about creating a connection with a group of strangers and turning them into an audience who are encouraged to contribute to the show in both expected and unexpected ways. Q: What is the secret to being a good busker? A: Charisma, showmanship and the ability to convince people to watch your show, and then pay for the memory of the show they’ve just seen. It’s almost a form of hypnosis when a good performer captures the imagination of a crowd, takes them on a journey, and then convinces them to buy the ticket for that journey as the voyage ends. Crack that formula and you’ll have success as a busker! Q: What other buskers are you looking forward to experiencing at the festival? A: Gazzo and Lee Ross — two old school buskers and long time friends! That being said, I’m really looking forward to catching any of the new acts that I haven’t seen before. I’m still very much a fan of the art form, and have an appreciation for anyone who’s willing to take a stab at making it as a busker.